China at the Tipping Point? from National Endowment for Democracy on Vimeo. Many analysts believe that the resilience of the PRC’s authoritarian regime is approaching its limits, as a result of deep changes that have been taking place in China. The state apparatus is still strong, but it must deal with an increasingly contentious, nimble, and resilient civil society. But does this mean there will be a “tipping point” away from authoritarianism in the near future? Citizens and activists now have better access to information through new media, but the police and censors are quite adept at quickly blocking any sensitive information that appears on the Internet. The leadership has also become much more adaptive than that of other authoritarian regimes, addressing the most pressing sources of popular dissatisfaction, such as increasing access to health and retirement insurance, tackling corruption, and cleaning up the environment. There is a high level of tension in the autonomous regions of Tibet and Xinjiang, but this may serve to strengthen rather than weaken the country’s authoritarian regime. 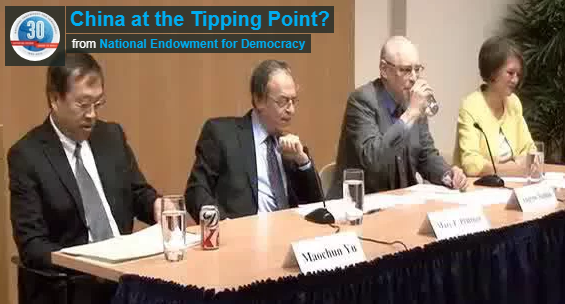 Andrew J. Nathan and Louisa Greve, who are among the contributors to a set of eight articles on China that appeared in the January 2013 Journal of Democracy, and Maochun Yu examined whether the evidence points to a coming period of significant political change in the PRC. Andrew J. Nathan is Class of 1919 Professor of Political Science at Columbia University, where his research interests include Chinese politics and foreign policy, the comparative study of political participation and political culture, and human rights. His latest book (co-authored with Andrew Scobell) is China’s Search for Security (Columbia University Press, 2012); he is currently working on a co-edited volume called Ambivalent Democrats that analyzes data from the Asian Barometer Surveys, and a single-author study of sources of political legitimacy in Asia. Louisa Greve is vice president for Asia, Middle East & North Africa, and Global Programs at the National Endowment for Democracy, where she previously served as the director for East Asia, senior program officer, and program officer. She has studied, worked, and travelled in Asia since 1980 and has testified before Congressional committees on human rights in China and democracy promotion in Asia. Maochun Miles Yu is a professor of history at the U.S. Naval Academy, where his research interests focus on China, East Asia, and military and diplomatic history. He is the founder and director of the U.S. Naval Academy Asia Forum. His publications include The Dragon’s War: Allied Operations and the Fate of China, 1937-1947 (The Naval Institute Press, 2006).